With convenient and intuitive menus, even first time users can easily use VE350. 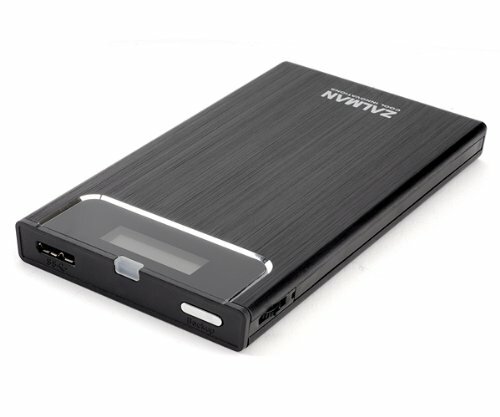 If an external HDD case with built-in hard disk is connected to a USB port of a desktop PC, notebook or netbook, the hardware will automatically be recognized and can be used instantly without installation. External HDD case has a subcompact design for portability and takes up minimal desk space. ZM-VE350 is an external HDD case which is compatible with 2.5” SATA I/II/III HDD. The whole aluminum-body design is elegant and effective against external shock and radiant heat of HDD. Pressing the Convenient One Touch Backup button once will automatically copy files to the selected folder. Pressing the button for more than 3 seconds will automatically turn power off, allowing the external hard drive to be removed safely without damaging the data. VE350 supports Virtual ODD which can be used as CD-ROM for convenient booting. VE350 is USB 3.0 hardware enclosure with built-in virtual CD emulator which supports ISO files. Plug-and Play, hardware will automatically be recognized and can be used instantly without software installation. ZM-VE350 is an external HDD case which is compatible with 2.5" SATA I/II/III HDD. The storage device will be enclosed in brushed aluminum casing and leather pouch is included for additional protection. Pressing the button for more than 3 seconds will automatically turn power off, allowing the external hard drive to be removed safely without damaging the data.